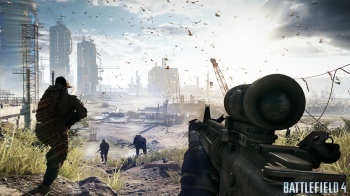 According to a new, seemingly legitimate notice the PC alpha test for Battlefield 4 begins on June 17. Last night a NeoGAF user calling him or herself "RoKKeR" uploaded an image that was ostensibly an official announcement from publisher EA and developer DICE. You can find it in full of NeoGAF, but the key takeaways are that Battlefield 4 enters alpha testing on the PC today, and that we now have some idea of what kind of hardware will be necessary to run the title. Here's where things get a bit fuzzy: Notice that the above quote reads "Recommended PC System Requirements?" Nowhere are we told what the minimum requirements are, which is generally the first burst of info included with any PC game. That quote doesn't even appear within the image RoKKeR posted, and instead was supplied by another NeoGAF user dubbed "Mathezar." What does all of this mean? That depends on how skeptical you are. Truth is, we have no reason to doubt any of this information as it does coincide with everything we know about DICE's modus operandi for testing its multiplayer titles. Though we've been unable to find any official confirmation of this information (beyond PC Gamer reporting it as fact), it seems pretty safe to assume that this is all for real. Hopefully either DICE or EA will get back to us shortly with an official confirmation. If any of you have received similar alpha test invites, we'd love to hear about it. The comments section below exists for exactly that kind of thing.